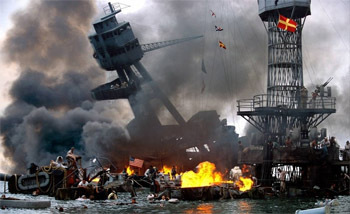 While true, red-blooded patriots took time today to look back on the 75th anniversary of the bombings of Pearl Harbor, Ewa Field, Hickam Field, Wheeler Field, Bellows Field and Ford Island, closet Democrats at Hawaii GOP headquarters had something else in mind. Today of all days, one high-ranking Hawaii GOP leader picked a truly horrible moment to advocate some of the most UN-Republican of values: seceding from the United States, overcharging the U.S. military to protect the people of Hawaii, and deliberately harming the industry which employs so many local residents. 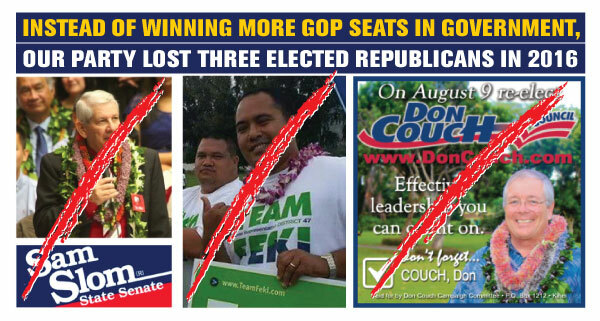 Dennis Egge , the same top Hawaii GOP officer (and Miriam Hellreich loyalist) who advocated last week in favor of the extinction of the Hawaii GOP chose to utilize today's editorial pages of the Honolulu Star-Advertiser to push the liberal Democrat, anti-American agenda of the RINO's who now control the Hawaii Republican Party. 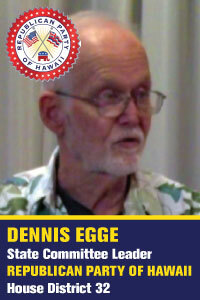 That's right, longtime GOP state committee member Egge picked December 7th to magnify the call of nutjob liberals and America-hating separatists for Hawaii to embrace the agenda of radical sovereignty activists. 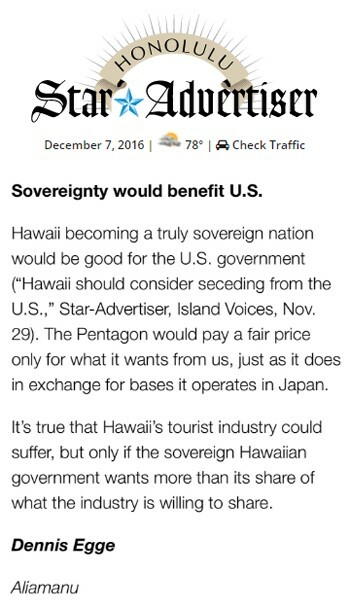 In Egge's letter below, you'll see a top Hawaii Republican call for Hawaii to (1) secede from the U.S.A., (2) charge the Pentagon to protect the Hawaiian Nation and then (3) get used to the idea of the tourism industry 'suffering'. 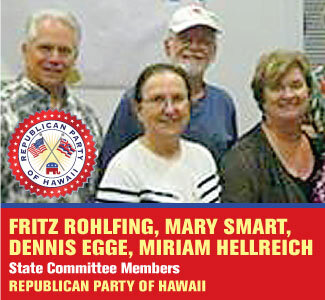 Be warned that Mr. Egge's embrace of fake history and progressive policies reflects the mainstream RINO thinking of the Hawaii GOP leadership under Miriam Hellreich, Pat Saiki and Fritz Rohlfing . . . not to mention the biggest advocate for ethnic separatism and racial division our state party has ever known: RINO Linda Lingle. What kind of party leadership have we been stuck with? Well, it's the kind that caused two elected Republicans to lose in 2016 and a third elected Republican to switch parties (to Democrat) in 2016 and then lose as a Democrat. Only six elected Republicans remain in office -- down from 22 just a few years ago. After watching three elected Republicans go down in flames in 2016 -- losing alongside every single GOP challenger on the ballot this year -- you deserve to know why our party keeps losing, stays on the sidelines, refuses to fight Democrats and even votes for harmful Democrat policies at the state legislature and the city council. Our party's longtime leadership in the islands is like a fish which rots from the head down. They never really intended to help the GOP win. Instead, today, here's yet another example of the kind of closet Democrat which comprises the RINO establishment leadership on the Hawaii GOP's State Committee.